The March 2015 spring break at Bard College Berlin was perhaps one of the most eventful holiday weeks. From the group trip to Budapest, to Morocco vacationing, and lastly, to the Bard/HESP Network Student Conference in Istanbul, everybody had their days full with new experiences and interesting people that furthered knowledge. My spring break adventures led me to Istanbul, where together with Lena Kück (BA1, Germany) and Kerry Bystrom as the faculty delegate, I represented Bard College Berlin at the yearly Student Action & Youth Leadership Conference. Organized by the Bard/HESP Network (Higher Education Support Program of the Open Society Foundations), the annual Student Action & Youth Leadership Conference takes place in Istanbul, Turkey and aims to gather students actively engaged in community projects, activism, journalism, Model UN, socially-based internships, as well as young leaders who are in the early stages of developing a project. The conference is all but a traditional academic assembly – it is rather a platform for building a network of young social entrepreneurs and inspiring future collaborations. This year the conference took place from March 13 to 19 and was focused on young social entrepreneurs. My impressions of Istanbul are largely informed by the plethora of experiences I had and the new acquaintances I made. All 38 participants were accommodated at the Chillout Hostel in the Beyoğlu district, located on the European side of Istanbul. The hostel was only a few minutes from the lively İstiklal Avenue and the conference venue. Although the long days of ‘conferencing’ left us with diminished energy levels in the evening, the convenient, easy movement around Istanbul’s Beyoğlu was a great incentive to get out – and once you are on the streets of Istanbul, you don’t even wish to go back anymore. Although the conference gave us a lot to think about, there are some workshops that are definitely worth stressing. Dean for Social Action from Bard College Annandale (BCA, as unofficially nicknamed in Istanbul), Paul Marienthal, gave two workshops on networking and public speaking. He focused on listening exercises, where the participants worked in pairs and talked to each other about their projects. Through these exercises, we practiced attentive listening, as well as Nonviolent Communication (NVC) – a communication method focused on empathy and self-expression, developed by American psychologist Marshall Rosenberg in the early 1960s. As the conference gathered students engaged in community work, Marienthal’s workshop was immensely valuable in thinking how to approach, communicate, and listen to the people whose communities we are working in. The Student Action & Youth Leadership Conference also addressed “Social Entrepreneurship” with a workshop on Monday, March 16th, led by Nick McGirl – a Londoner who works for Ashoka Europe in Istanbul. He focused on how ideas can be translated into action and how thinking outside the box sometimes leads to the simplest solutions. As an example he cited Discovering Hands, a project started by Dr. Frank Hoffmann devoted to training visually impaired women to deploy their better developed sensory skills to detect the early signs of breast cancer. Through its many other panels and workshops, the conference aimed to broaden our understanding of writing proposals, conceiving, financing and realizing projects, developing community partnerships, crowdsourcing for social entrepreneurship, and managing volunteers. Nonetheless, at the heart of the five-day Istanbul gathering were the student presentations. Divided in three blocks of three to four hours, all students were expected to give a ten-minute presentation on their project, followed by a five-minute Q&A. Students from all the Bard-affiliated institutions – Al-Quds Bard College for Arts and Sciences; American University of Central Asia, Bard College (Annandale-on-Hudson); Bard College at Simon’s Rock; European Humanities University; Bard College Berlin; Smolny College (Faculty of Liberal Arts and Sciences, St. Petersburg State University) – got their 15 minutes of spotlight in Istanbul. The presentations covered an array of topics. To name just a few: Debate Clubs, The Sister Cities Project, Brothers at Bard, Galaxy 35 mm – Film Festival of short films for children and young people about children and young people… Bard College Berlin presented two projects: Reviving German Youth Clubs, presented by Lena Kück, and Peace Education through Civic Engagement in High Schools – my proposed project. All the presentations were met with great enthusiasm, inspiring ideas and insightful questions. The students spent two days before the presentations preparing with their assigned mentors and working towards making their 15 minutes worthwhile for themselves and their audience. With the clock ticking noon on Wednesday, the student presentations were completed and we all felt ready to go sightseeing on our last day. The four-hour long Historic Tour through Istanbul led us to the Sultanahmet area, Hagia Sophia, Blue Mosque, and Music for Peace Foundation. 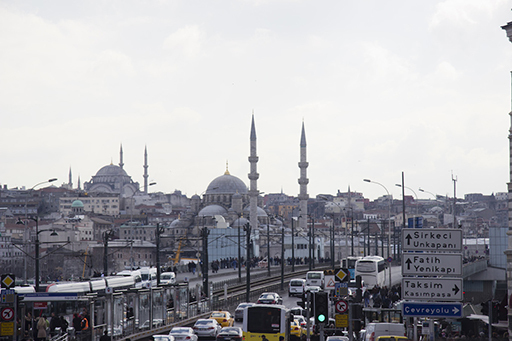 The tour took an educational approach to the history of Istanbul by reflecting on how history and contemporary issues in Turkey are connected. It was the perfect closing of the dynamic circle called Student Action & Youth Leadership Conference, Istanbul 2015. With high hopes for the future development of Civic Engagement at Bard College Berlin, I left Istanbul reinvigorated and energized – ready to tackle new challenges, and most importantly: remembering that an idea realized is worth more than a thousand ideas imagined.